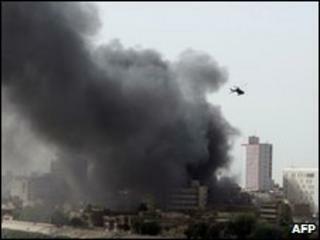 An attack on the Iraqi central bank in Baghdad has killed 15 people and left more than 50 injured. The assault began with a bomb blast. Gunmen then battled with police as they tried to storm the building. Five gunmen blew themselves up, police said. The BBC's Jim Muir Baghdad says it is unclear if it was a bank raid, an insurgent attack, or both. The attack came one day before Iraq's new parliament was due to hold its first session. Many of those killed were bank employees, security officials say. Our correspondent says that in recent months there have been several well-organised attacks on jewellery stores and banks. US and Iraqi officials have said they are being carried out by insurgent groups desperate to raise cash to finance their operations. Television pictures showed a column of black smoke rising over Baghdad from the scene of the explosions and ambulances racing through the city streets. A nearby generator caught fire along with its fuel store sending up a thick pall of black smoke. Violence has dropped sharply in Iraq since 2006-07, but unrest has simmered since the general election in March produced no outright winner. A deal between the various parties to form a government and choose a prime minister has not been reached and may still take weeks of negotiations, analysts say.